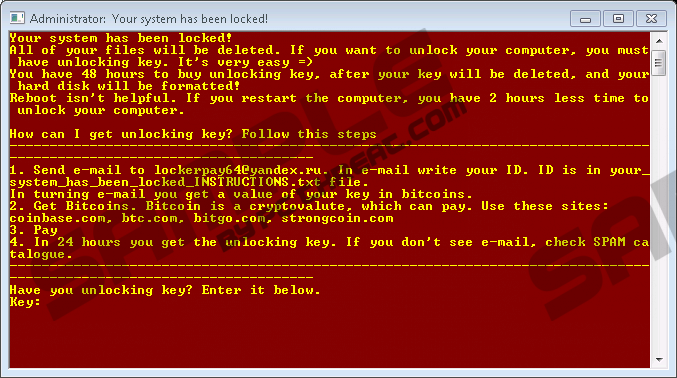 LockerPay Ransomware, also known as Locker-Pay Ransomware, is an infection that you might let onto your own Windows operating system by opening a corrupted spam email attachment. As you might know – if you keep yourself up-to-date with all virtual security-related news – most ransomware threats are spread via spam emails because their launchers can be concealed as harmless files. Of course, it is not difficult to evade misleading emails and files attached to them if you know about the risk of facing malware, but, unfortunately, many users are usually quite careless. On top of that, once the malicious launcher is executed, there is no indication regarding that. The threat remains silent for as long as the files are being decrypted. Once they are fully encrypted, the infection reveals itself using intimidating messages. After that, you cannot do anything to stop the process. All in all, whether or not you get your personal files decrypted, it is most important that you remove LockerPay Ransomware. Learn how to do that by reading this report. The devious LockerPay Ransomware goes after your personal files because you are most likely to pay a ransom in return of their decryption. While you can reinstall software files and even certain system files, you cannot renew personal files unless they are backed up outside the infected computer. Do you have backups on an external drive? If you do, you can relax because you can recover your files after you remove the malicious threat. If your files are not backed up, you are likely to focus on the intimidating ransom demands. As soon as the encryption process is complete, LockerPay Ransomware displays the “Administrator: Your system has been locked!”window with intimidating demands. The exact same text is also represented via a file called “your_system_has_been_locked_INSTRUCTIONS.txt,” and this file should be placed in every directory containing the encrypted files. The purpose of the message is to inform you that you are expected to email lockerpay64@yandex.ru and then pay a ransom fee to get your files decrypted. If you email the creator of LockerPay Ransomware and reveal your personal ID, you should be introduced to a ransom sum that you are expected to pay to have your personal files unlocked. The question is: Will your files be unlocked if you pay the ransom? Unfortunately, that is impossible to know. While the creator should be capable of providing its victims with a working decryption key, we do not know if they would. On top of that, the ransom fee might be extremely big. Whether or not you have the money to cover the ransom, we suggest looking for a free file decryptor first. At the time of research, a tool that could help did not exist, and we cannot promise that it had been created by the time you are reading this report. In most cases, ransomware infections remain “undecryptable.” Obviously, that is not something you need to worry about if your files are backed up. If they are not, you might be facing permanent loss. In either case, make sure you start backing up ALL of your files after you delete LockerPay Ransomware from your operating system. It is important that you find the launcher of LockerPay Ransomware. This is the main file that you need to delete to get rid of the malicious ransomware. Afterward, you should erase the ransom files scattered across the PC, and you are done. Of course, if other infections are active, you will need to take care of them as well. If you decide to delete LockerPay Ransomware and other infections manually, we advise scanning your PC first. This way, you will know where the malicious .exe file is, as well as all other threats. Needless to say, manual removal is not easy or problem-free. If you are less experienced, it might be best for you to employ anti-malware software right away. Even if you succeed with manual removal, consider using anti-malware software to ensure that your operating system stays malware-free in the future. If you want to ask us questions regarding the threat or its removal, use the comments section. Identify the malicious launcher file (the name is random). Also Delete all copies of the your_system_has_been_locked_INSTRUCTIONS.txt file. Empty Recycle Bin to get rid of all malicious ransomware components. Scan your PC using a legitimate malware scanner to see if you have successfully deleted the infection. Quick & tested solution for LockerPay Ransomware removal.